I love Halloween! It’s been my favorite time of the year for as long as I can remember. I love it so much because of all of the fun, goofy imagery and if you really want to dig a little deeper, it’s the one time of year we are encouraged to ‘be someone/something else.’ It stimulates the imagination, and brings us together as a people in the form of parties, games, and even Trick Or Treating. With all of that fun, there is always a potential for bad things to happen. That’s where “Spooky Magic” comes in: in this fast-paced, goofy Halloween extravaganza, I deliver some important safety tips designed to get kids (and just as important, the parents and teachers watching) thinking about staying safe during all of the Halloween mayhem. Now don’t get me wrong: this is not a preachy kind of show at all. 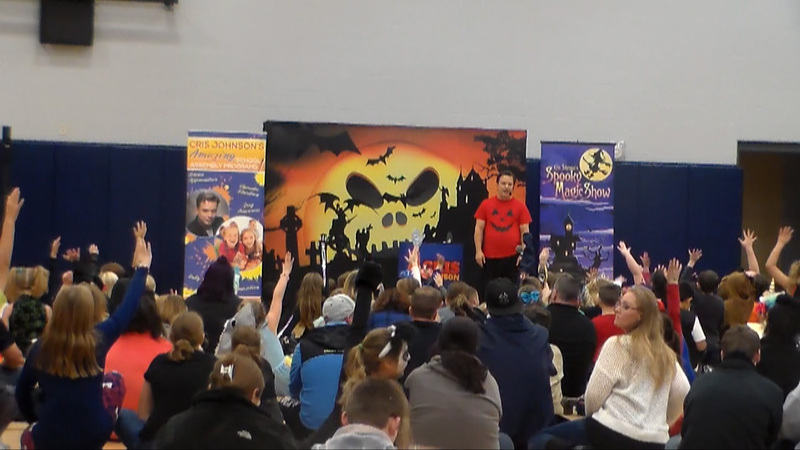 Most of my school assembly programs are crammed full of life lessons and curriculum-based concepts, but in “Spooky Magic,” I deliver these lessons with a lighter touch. Simply put, this time of year the kids might have so much sugar coursing their veins that a heavy-handed approach would be rejected, so in this show, the lessons are lighter and less intense. 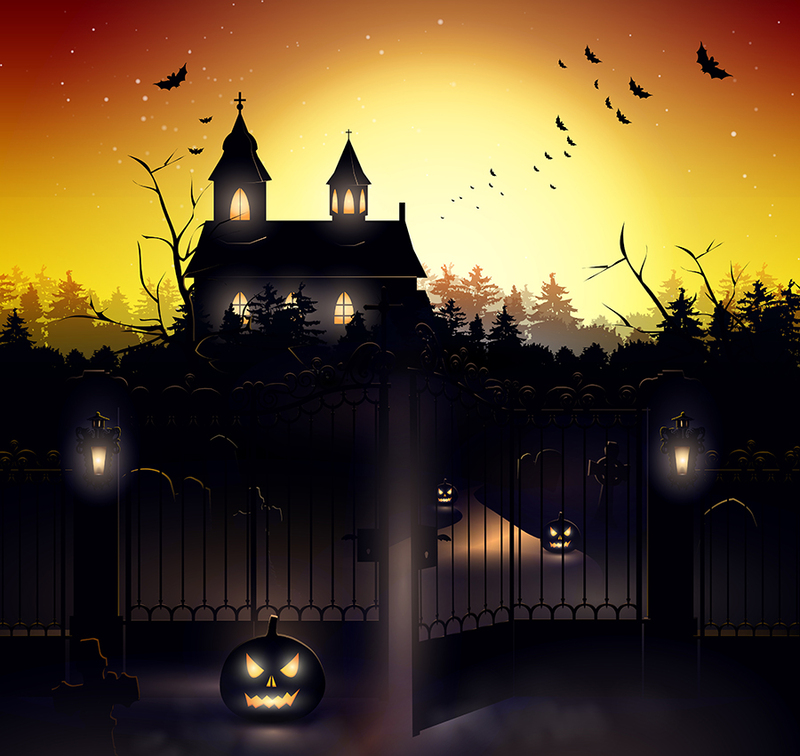 From the kids’ perspective, they love the colorful Halloween-themed set design with my large Jack O’ Lantern-style backdrop and banners and the haunted house motif. There’s custom-designed magic props specifically built for this show – it’s the only time of year many of these magic effects see the light of day or night! Because I offer programs to both schools and libraries, rest assured that if your event is a family-oriented library show, the props and decorations I bring are designed to fit in a library. If your event is being held in a school for several hundred people, I bring out the big stuff both in terms of set design and PA system as well as bigger props and fun! A spooky ghost flies around the room, causing the entire audience to squeal with delight! A fun Halloween Costume Contest where a volunteer predicts the winner! 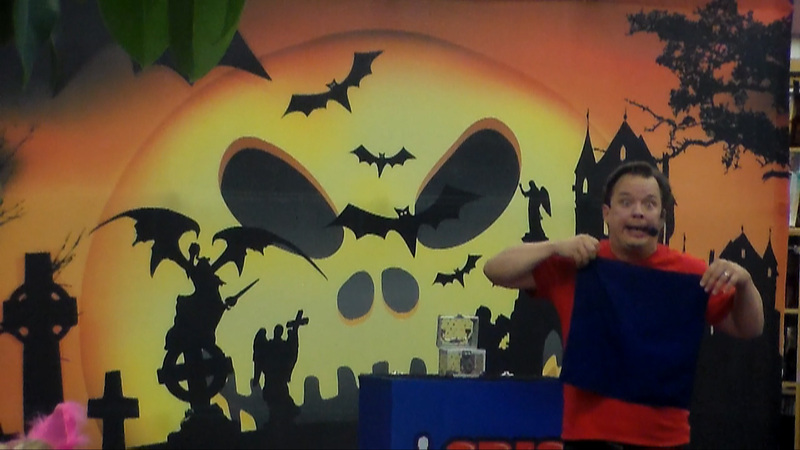 A fun Spooky Race where children compete against adults to win free magic tricks! A drawing of Frankenstein’s Monster comes to life!! A mysterious table FLOATS in the air!! The month of October fills up every year and I have to turn away several clients and events each season. If I could “clone” myself I could be at several places at once and I’d never have to say ‘no’ to anyone ever again but until cloning becomes a reality, I DO have to warn you to book as early as you can for the Halloween season! Call (716) 940-8963 TODAY (that’s my cell phone number) or fill out the Contact Form above to have “Spooky Magic” information sent to you immediately! 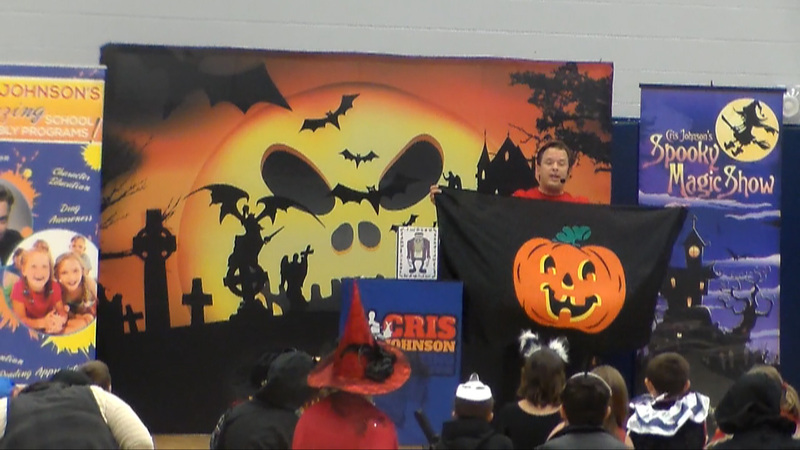 Cris Johnson is a true professional and a performer that I can always count on putting on a terrific show. Cris has been to our library on many occasions and presented to audiences of all age groups. His Spooky Magic and Tales from the Beyond shows are simply amazing – perfect for our tweens and teens. As a matter of fact, they are still talking about Cris’s last show at the library and keep asking me when he will be back. Soon I say – very soon. Money well spent! !